Ambidextrous thumb stud. Flipper. SpeedSafe opening mechanism. Black finish. Kershaw Cryo Hinderer Assisted Opening Framelock. 3 3/4 closed. 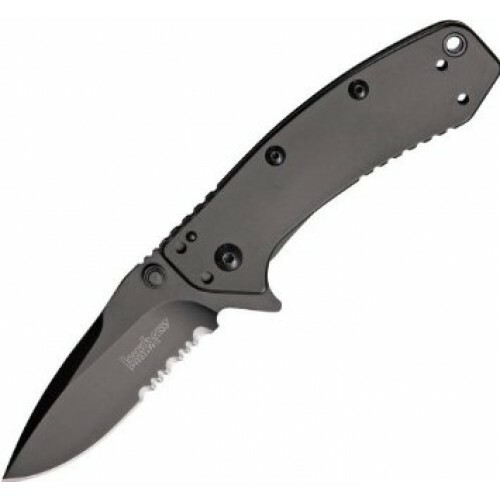 2 3/4 8Cr13MoV stainless blade with dual thumb studs and flipper. Stainless handles with Hinderer lockbar stabilizer. Oversized lanyard hole. Four-way reversible stainless pocket clip. Rick Hinderer design. 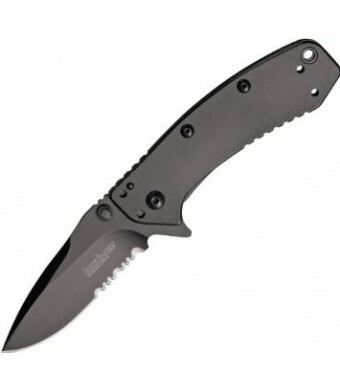 Black DLC finish partially serrated blade. Black DLC finish handles.